Living in Burlington, we’re very lucky to be surrounded by many amazing restaurants. 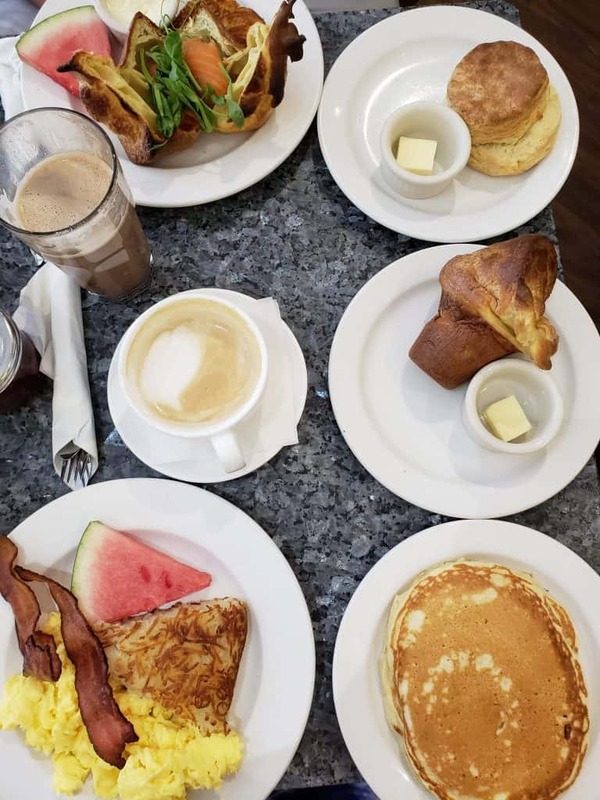 While we will endeavor to try all of them eventually, for the moment we’ve decided to prioritize our favorite meal of the day: breakfast, often known in later hours as brunch. 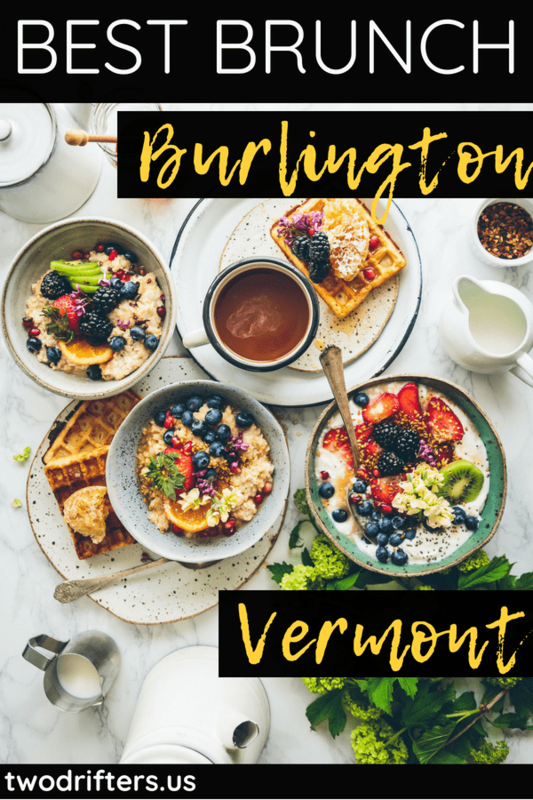 In the name of research (and making our tastebuds happy), we’ve been sampling all of the top breakfast spots in Burlington, Vermont. On the weekends, these places are the go-to eateries for brunch, that mimosa-fueled, home fry-laden, delightful culinary event. 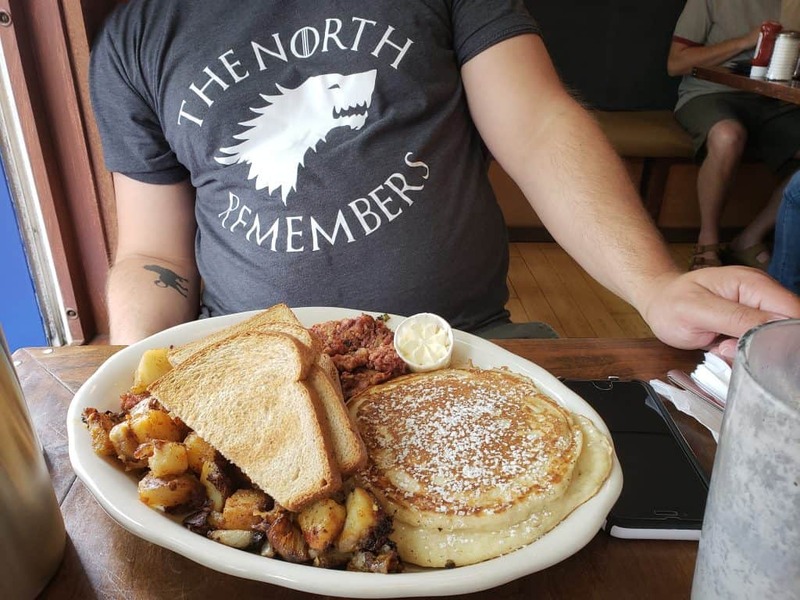 As we’ve munched our way across town, we’ve discovered and ranked what we think is among the best breakfast in Burlington VT.
*Please note, we’re still eating, and the list will be updated as needed. We might be cheating a bit with Sneakers, which is *technically* in Winooski, Vermont. 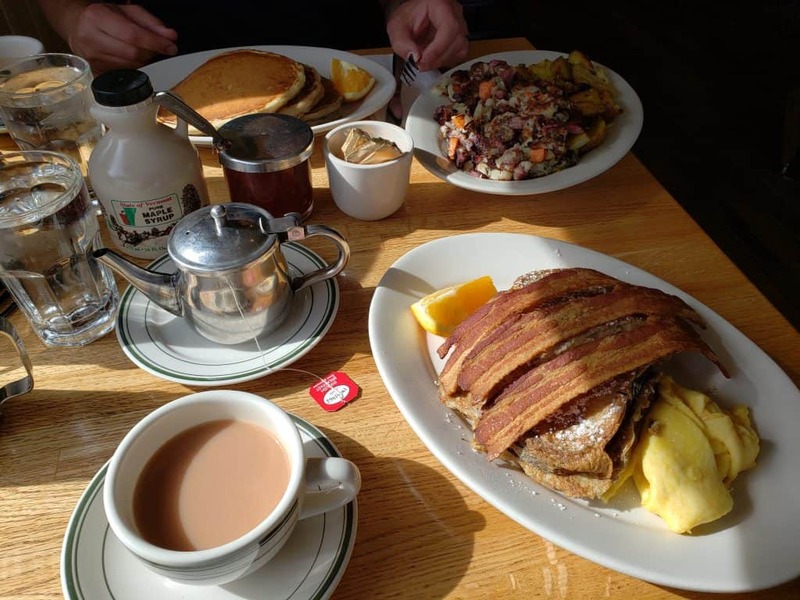 However, it’s just a few minutes’ drive from downtown, and it is not only a worthy option for your Burlington VT breakfast spot, it’s actually our #1 pick. Sneakers is bright, cute, and airy, but they could serve food in a cardboard box and it would still be great. The options here are delicious and unique, with piping hot food served in plentiful amounts. The menu is full of appetizing dishes, so you’ll probably have a hard time choosing. There are various types of benedicts, Kahlua-dipped french toast, and chicken and waffles, just to name a few. There are always yummy specials, including cocktail specials and even milkshakes, but I’d recommend the Vermont apple cider mimosa for your beverage. It’s a tart, refreshing drink, and at just $6.50, it’s a refreshing price, too. 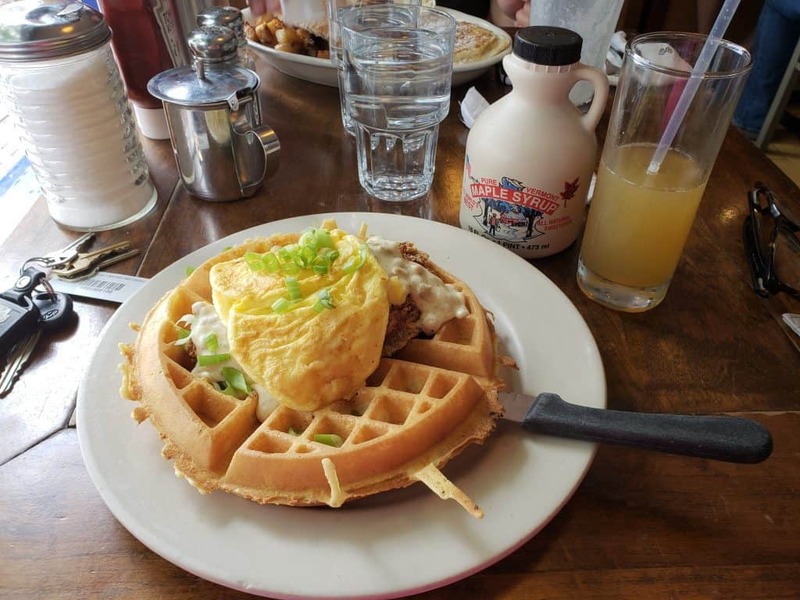 If you’d prefer to stay downtown, the Skinny Pancake has one of the best locations for brunch in Burlington, VT. The restaurant is situated almost directly on the waterfront, so you can eat and then go for a stroll along Lake Champlain. 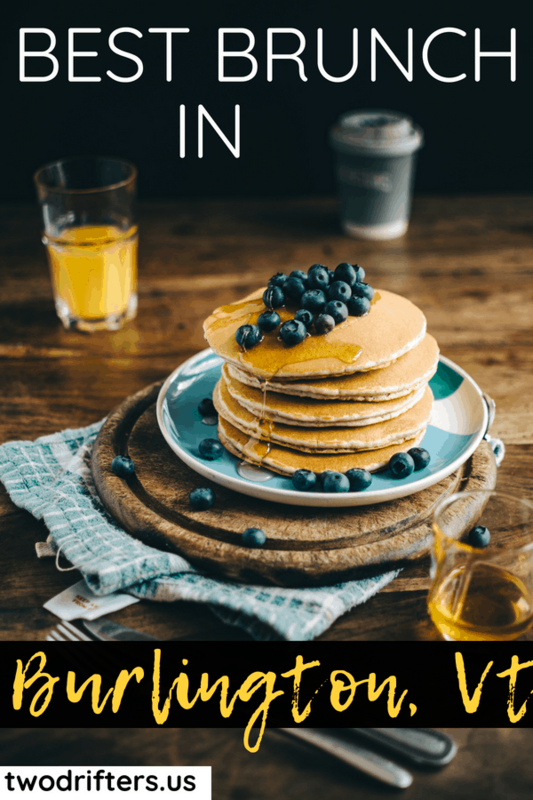 The Skinny Pancake is definitely high on our list because they have a huge breakfast menu. It’s also a generally fun place to go. On the weekends, they often have live music playing on the patio. Unlike other breakfast spots in Burlington, the wait tends not to be as long, perhaps because this is a place with counter service. The Skinny Pancake is famous for their fantastic crepes. Prioritizing local produce and local food suppliers, there are both sweet and savoury crepes. Nathan likes the Lumberjack, a crepe with local ham and Cabot cheddar. I think you can’t go wrong with a basic Sugarshack (made with VT maple sugar) or a Hot Apple Crumble. There’s so many creative possibilities, and vegans will like the options too. 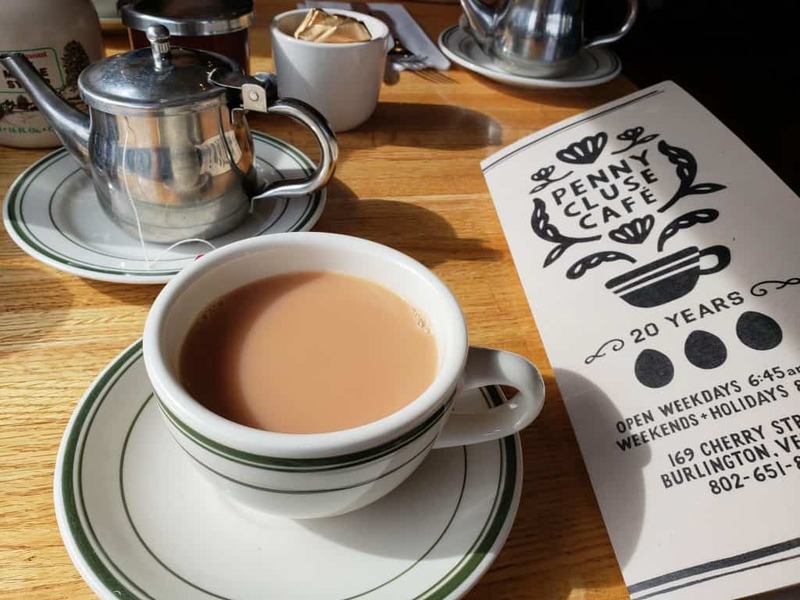 In addition to their crepes, The Skinny Pancake offers an all day breakfast menu which includes basics like hash browns, a breakfast burrito, veggie hash, and my absolute fave: biscuits and gravy. 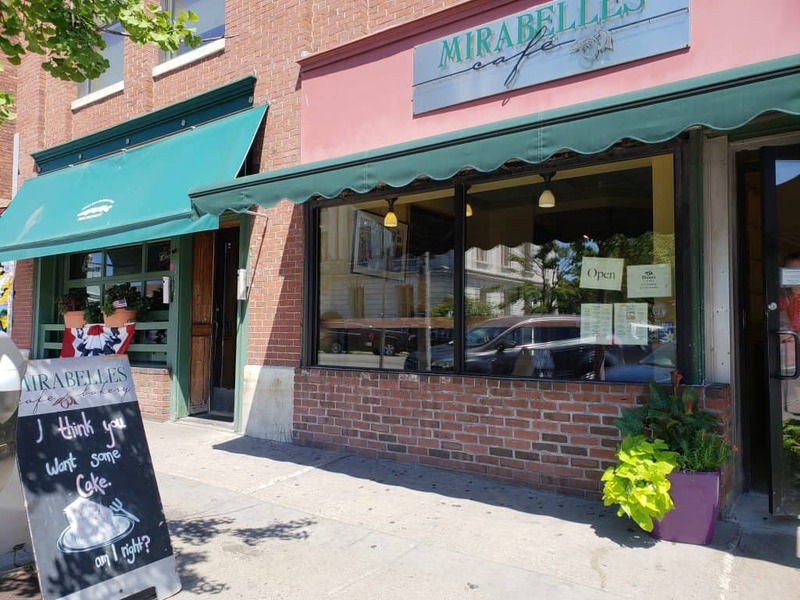 Mirabelle’s is another of the great breakfast restaurants Burlington VT has to offer. Mirabelle’s is a small bakery/restaurant that is cozy and bright. It’s located on Main Street in Burlington, and with an unassuming exterior, you could easily blink and miss it. We recently ate here for my (Amy’s) birthday, and enjoyed quite a spread. See photo below. To be honest, we may have ordered too much, but everything was super good. And we couldn’t help but order some extra sides. Mirabelle’s has popovers on the menu, which is one of my all time favorite things, so I couldn’t resist. 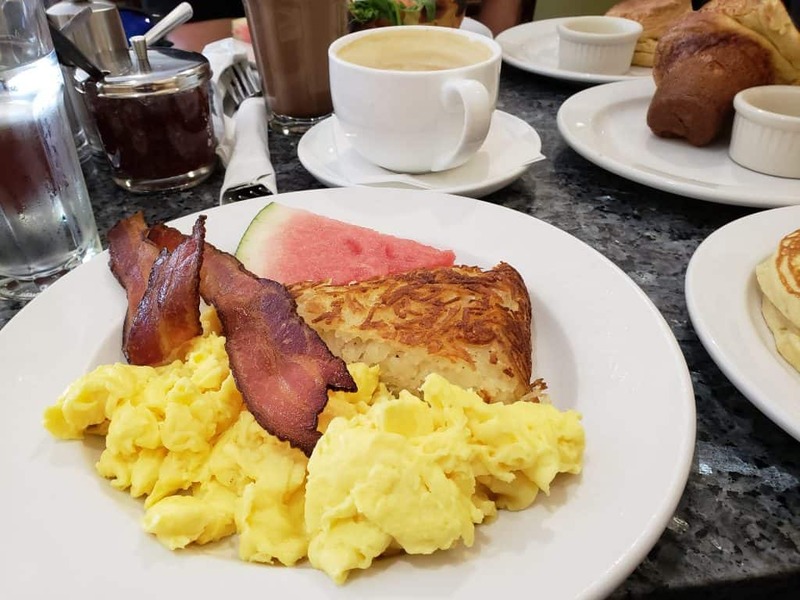 Nathan ordered the Popover Breakfast, a smoked salmon dish that is served with eggs and lemon-shallot crème fraîche on top of a split popover. (He skipped the eggs cause he’s not a fan). I ordered the No. 2 Breakfast, which is a smorgasbord that includes eggs and hashbrowns plus a choice of pancakes or french toast and sausage, ham, or bacon. A standout of this restaurant was the hashbrowns. They were perfect: crisp and perfectly browned, with the right amount of saltiness. I also like how they are served in a sort of cake form, it looks good and keeps the entire outer edge crisp and delicious. And the scrambled eggs get an A, too. Fluffy and still piping hot. The pancakes were swoonworthy. Really good and I ate them all, though I was already stuffed. We also enjoyed our meal at Penny Cluse, but not as much as the previous restaurants. I think we’ll need to give Penny Cluse another chance, and perhaps order some of the more adventurous items on the menu. A friend tells me that the ‘Bucket o’ Spuds’ is to die for. (A heaping mound of homefries with melted cheese, salsa, sour cream and green onions). 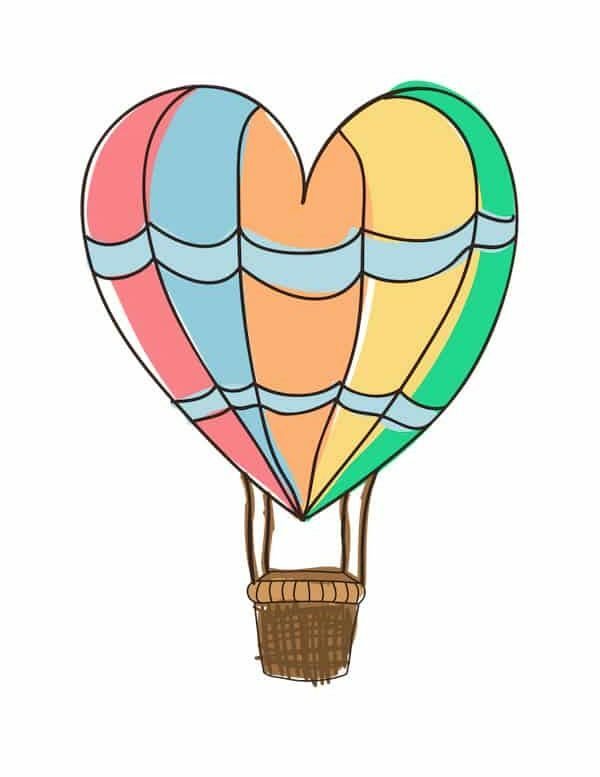 Penny Cluse does have fast service and a friendly staff, as well as a great location. Expect a wait on the weekend—this place is always packed. 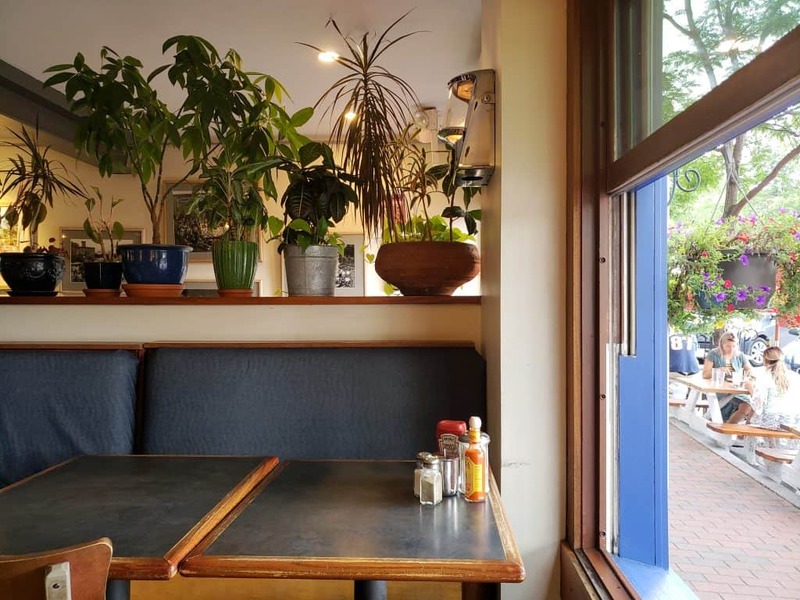 It is a really nice spot, and has the vibe of a busy, happy diner, so definitely give it a try for your next brunch in Burlington VT.
Where should we eat next? I would add to the list The Swingin’ Pinwheel http://www.theswinginpinwheel.com in Burlington one block off the pedestrian area of Church St.
We’ll have to try that one, thanks! mmm we will have to check it out, thanks!